What your face to face Skype session looks like. 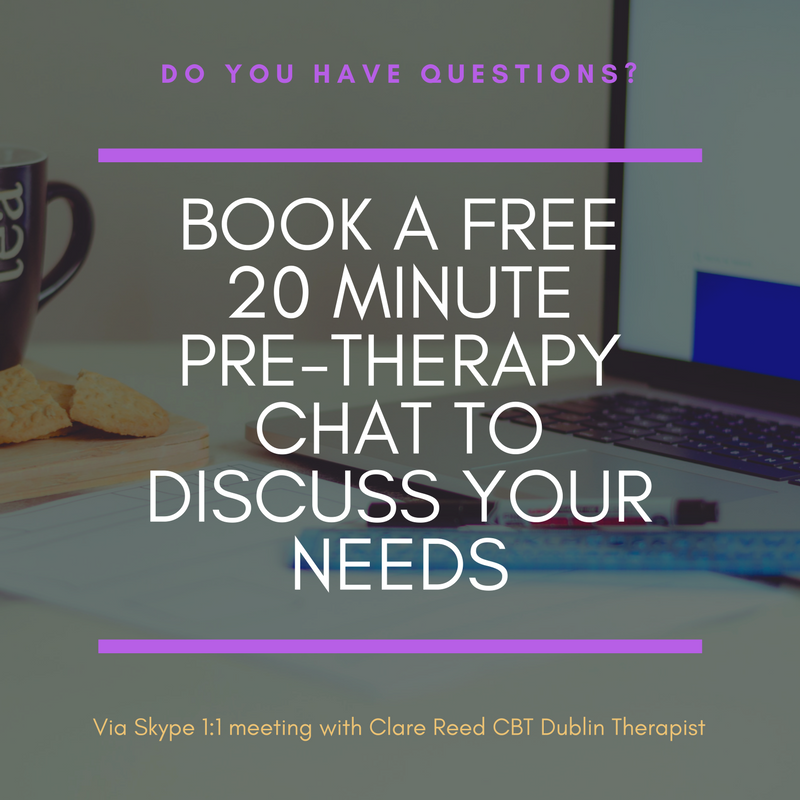 At CBT Dublin we offer CBT online Skype sessions, which is commonly referred to as On-Line Therapy, via Skype. This is the fastest, global, growing way to deliver high quality and professional CBT sessions. We have switched to this format after 8 years of using our old 'in office' format (though we have also had Skype option clients, along with in office clients over the last five years too), as it provides an easy and better service for our clients, as they get to have the therapy in the comfort of their own home rather than battling through the city to get to the office and then home again. Also, after trialing this format, in conjunction with our tech support platform, which we introduced to our Skype clients in 2015, we think this offers a superior service to our clients, as opposed to the old office format and paper handouts. 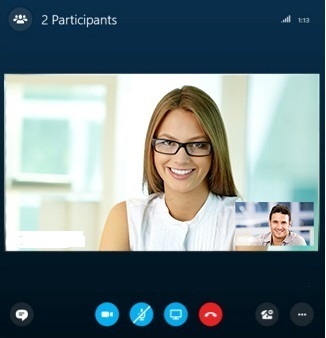 The option to have Skype sessions, when travelling abroad, also allows for continuity in therapy. And this is also useful for clients based overseas who want to work with an English speaking therapist. But, importantly, it means appropriate therapy fees for this service, an option we ran out of in 2016, as Dublin office rents have skyrocketed over the past two years, it didn't sit well with us to have to increase our client fees in order to satisfy 'sky high' rents. This is a screenshot of our easy to use CBT tech support system. 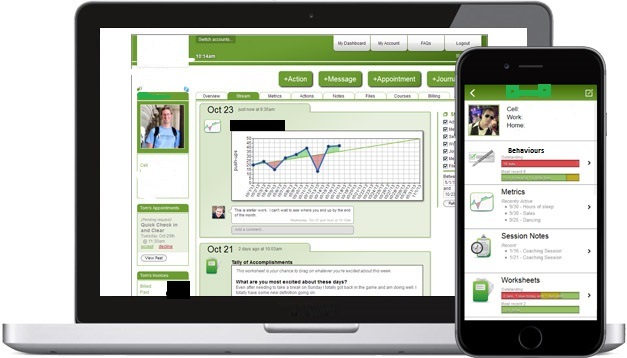 Because we love using technology so much, we have a great online therapy system that you will use in conjunction with the face to face Skype application, that you will be given your own private secured account on, to keep all your CBT worksheets and notes in one place and that our therapist can access when you have completed them for her to see and we have all our session supporting video's and techniques on there for you to use at your leisure. But the best part is that we can set up reminders for actions in-between sessions.There is also an interactive whiteboard (a must in CBT!) on the system for going through different techniques and thoughts. Also, on the system is a handy journal to keep notes between sessions that you might want to discuss in therapy. And the 'cherry on the cake' is that you can access the system from a computer, tablet and mobile phone so you can be mobile with your therapy. Our clients love using this system, as it is flexible and helps keep them on track and stay organised through their therapy. 2. Set up a Skype account - this is free! 2. If you do not have a camera on your device, connect a webcam to your computer (this is preferable, but not essential) some of our clients prefer to not be seen on camera and we respect their privacy in this matter so you can just have the therapy conducted by call via Skype instead of a video conference call, whilst still seeing your therapist on the screen. It's up to you. 3. If your microphone is not the best, consider getting a good quality microphone, so that we can both hear each other - these can be found at most good computer shops, sometimes your mobile headset can be just as good. 4. As with face to face CBT sessions, you will need to ensure that you are somewhere where you can speak in confidence without any disruptions, if you are using your computer for the call it is a good idea to put your mobile or phone on silent to avoid disruptions. 5. Provide payment by Paypal for your Skype session prior to your scheduled session, you will see an option for booking a Skype session in the online booking tool and once set up on the system you will receive an automated invoice on the day of your session which has a Paypal link. 6. During the session make sure you have a pad and pen to write notes with and make sure you are comfortable, something to drink is handy. 7. During the session the CBT therapist may share notes with you, use the virtual whiteboard or provide you with visual presentations of tools for you to look at using the online system, you will be given access to your own private account on the system from the 2nd session. 8. After most sessions the therapist will use the online tech system (detailed above) to send you some worksheets to complete for the next session, which you can fill in on the online platform for the therapist to look at before the following session. If you have any questions about this modern way of having cognitive behavioural therapy please let us know by contacting us.